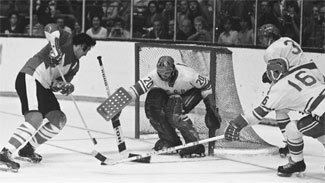 Forty years ago Sunday, the hockey world was fundamentally changed by the start of an eight-game series between national teams from Canada, loaded with NHL players in their prime, and the Soviet Union -- considered the two best hockey-playing nations in the world at the time -- that played out across the month of September. The series was a must-follow for hockey fans across the globe and after its dramatic conclusion --- a 4-3-1 series win for the Canadians -- there was no question that the NHL would never be the same again. This month, NHL.com looks at the historic Summit Series with a month-long collection of content. Today, NHL.com provides an overview of what the series meant from some of those who helped make the history happen. Stay tuned for additional comment throughout September. The first weekend of September 1972 was marked by the start of the greatest hockey series ever staged. It's become known as the Summit Series, though four decades ago it was simply called the Canada-U.S.S.R. series – an eight-game showdown between hockey’s two superpowers. Forty years have passed since Canada and the Soviet Union met in a landmark eight-game series that changed hockey forever, and the effects are still evident in the sport all these years later. NHL.com now turns back the clock to celebrate the 40th anniversary of the 1972 Summit Series. On Sept. 2, 1972, Team Canada – basically the best of the National Hockey League minus Bobby Hull, who had signed with the fledgling World Hockey Association and was deemed ineligible to play, and injured superstar Bobby Orr – began a long-awaited series against the Soviet Union's national team, which was the best "amateur" team of the time. This was an era when professional players were ineligible for the Olympics; the Soviet players ostensibly held jobs (many were in the military), but their real occupation was "hockey player." The NHL was not the 30-team, coast-to-coast enterprise we know today. There were 14 teams -- only three in Canada and just two (Vancouver and Los Angeles) west of St. Louis, which was also the southernmost franchise except for L.A. With the exception of a small sprinkling of Americans, it was a league of Canadians that was sure it played the best hockey in the world. The Soviets were a mystery. They had won the prior three Olympic gold medals after being upset by the United States at Squaw Valley in 1960, but Canada had to use amateurs -- and for the 1972 Games, the Canadians didn’t even bother sending a team because of a dispute with the International Ice Hockey Federation. Canadian fans felt that had their country been able to send its best players, the result would have been a lot different. Scouting back then was nowhere near as developed as it is now, and none of the Canadian players had seen much of the Soviets. "We didn't know anything about them," Hall of Fame member Rod Gilbert told NHL.com. "We had no idea how good they were." After negotiations that involved Canadian diplomats and Soviet newspaper editors, among others, the series was set for September 1972, prior to the start of the new NHL season. The format was simple – eight games, four in each country, to see which nation really had the best hockey. Seeing Russians in the NHL is something we take for granted today -- many have been among the League’s best players in the two decades since the end of the Iron Curtain. But this was 1972; the series would be played at the height of the Cold War and provoked intense feelings of nationalism among fans on both sides. "There was great pressure on us," Gilbert said. "We couldn't lose this series. It was the most incredible pressure I've ever been under." Still, Canadian fans were certain that the best of the NHL would make short work of the Soviets; in a pre-tournament poll of Canadian journalists by The Hockey News, not one expected the Soviets to win even one game -- though some others, who had seen the Soviets in person, warned that they would arrive in top shape and could well win not only a game or two but the series. "Both teams won in 1972. It was a great series for all of hockey. The best that Russia had and the best of the NHL. The winner was the game of hockey." "We didn't take them seriously," said forward Paul Henderson, who went on to be the hero of the series. "We knew they were good hockey players. But the lineup we had -- how could we ever lose?" They got a quick answer when the Soviets overcame an early 2-0 deficit to win the first game 7-3 in Montreal. The Soviets were 3-1-1 before Team Canada rallied to win the final three games in Moscow, capturing the series when Henderson's last-minute goal gave the Canadians a 6-5 victory in the eighth and final game on Sept 28. Henderson’s goal set off celebrations all over Canada, which less than a month earlier was certain its heroes were headed for an eight-game sweep. The series, and especially Henderson's third winner in as many games, became a landmark cultural event in Canadian history and a huge source of national pride. But it also showed that the Soviets' "amateurs" were just as good as the NHL’s professionals, something they proved numerous times before the walls between pros and amateurs came tumbling down along with the Iron Curtain. But the biggest consequence of the series was what Soviet star Boris Mikhailov called "a meeting between two schools of hockey." The fruits of that meeting, and the changes it engendered in the sport, are still felt today. "Both teams won in 1972," Vladislav Tretiak, now the president of the Russian Ice Hockey Federation, told TSN this summer. "It was a great series for all of hockey. The best that Russia had and the best of the NHL. The winner was the game of hockey."